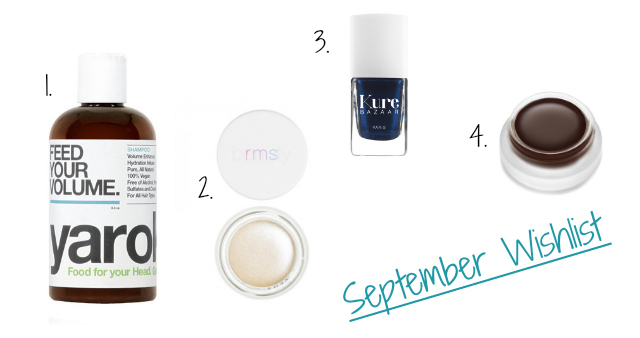 I still can't quite believe it's September already, but that's as good an excuse as any to share what I've been adding to my ever-growing wish list! If only I had a bottomless pit of money to buy everything! Yarok Feed Your Volume Shampoo (£19.00): I recently reviewed Yarok's Feed Your Youth Hair Serum (here) and was left wanting to try more from the brand. It seems like every green blogger on twitter is in love with this shampoo too so even more reason to want to try it! Yes it's expensive, but it must be worth it if it's as good as everyone says it is! RMS Beauty Living Luminizer (£30.00): I have a little sample of this and my goodness is it gorgeous! Some highlighters can make you look like a disco ball but thankfully this isn't one of them! Say hello to the perfect sheer glowing skin. I think this will quickly become a favourite of mine! Kure Bazaar Rock Star (£14.95): Kure Bazaar are one of the 'cleaner' nail polish brands I've yet to try and this midnight blue shade looks amazing. I could see myself wearing this shade a lot over the winter months, especially since I don't have a colour like this in my collection already. RMS Beauty Cream Eye Shadow in Karma (£19.00): Lusting after even more from RMS Beauty here. Can you believe I've never actually owned a cream eyeshadow?! I saw this shade reviewed on Lilly's blog (Genuine Glow) a while back and it just looks perfect for a smoky eye. What do you think of my wish list this month? Have you tried any of these products before? The cream shadow looks lovely! I've never actually owned a highlighter, is that bad?! The stuff is a bit pricey for me but looks good! The blue nail polish is absolutely gorgeous :) I've never actually tried a 'natural' nail polish so maybe I should invest in one. I need to know where you got a sample of the RMS highlighter! I really want to try it but for £30 I'm terrified!